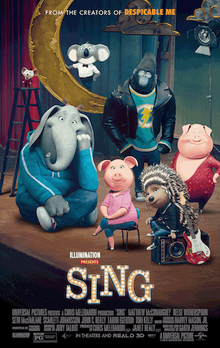 Sing is a 2016 Illumination Entertainment animated musical comedy about an animal singing competition. Buster Moon (Matthew McConaughey), owner of the Moon theater, is on the verge of bankruptcy, but makes one last try at success to save his lifelong dream of running a successful theater: a singing competition with a prize of $1000, which is slightly more cash than he actually has in hand. Except, due to a clerical error by his assistant, the posters for the competition indicate that the cash prize is actually $100,000, so the contest draws a lot more notice than he expected.